Noble Poker is owned by iGlobalMedia Entertainment Limited, a subsidiary of ElectraWorks Limited. It is fully licensed and regulated by the Government of Gibraltar. Noble Poker ensures the safety and security of your financial and personal information through the use of 128-bit SSL data encryption technology. Noble Poker is developed, maintained and backed by the online gaming software provider,Playtech. The software is available in a downloadable version and an instant no-download flash version. The software supports play in multiple languages including English, French, German, Russian, Spanish and Swedish. Noble Poker offers a variety of poker games including Texas Hold’em, Omaha and Omaha hi-lo. Rakes for the games range from $0.02/$0.04 to $50/$100 in limit games and $0.01/$0.02 to $25/$50 in no limit and pot limit games. 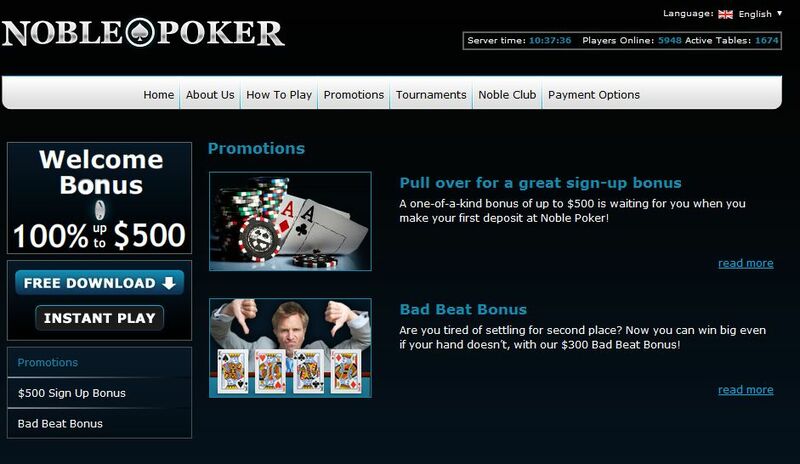 Noble Poker offers a comprehensive tournament schedule with tournaments running 24/7. Their tournaments include guaranteed prize pool events, freerolls, satellite tournaments, multi table tournaments and single table tournaments. Multi table buy-ins range from $10 to $300. Noble Poker offers a range of exciting bonuses and promotions for their new and existing players. New players at the site are eligible for a welcome bonus of a 100% match deposit bonus up to $500 on their first deposit at the site. They offer many exciting promotional tournaments. There are five different satellite tournaments to win seats at the WSOP (World Series of Poker) 2010. Players can win seats at the ECOOP (European Championship of Online Poker) VI and the Mini ECOOP VI. Every Friday, just by making a deposit during the day, you could be entered into a freeroll tournament. Win six in a row at the Knock Fort Knox sit and go tournament and you could be in with a chance to win $50,000. Every Sunday, Noble Poker hosts a If you win five consecutive Maui Jackpot sit and go tournaments, you could win $15,000. Win six consecutive Rio Jackpot sit and go tournaments and you could win $25,000 or more. You can also take part in Tony G’s $1,500 Sunday bike ride freeroll and $300 bounty hunt. Noble Poker runs the Noble Club – a VIP loyalty program with six VIP crown levels. Players in the VIP program earn loyalty points bonuses. As you move up in the VIP club you are eligible to take part in special VIP rolls and you will have access to exclusive promotions. If you have any questions when playing at Noble Poker, you can contact a customer service representative 24 hours a day, seven days a week. They can be contacted via telephone, email, fax and instant live chat. Players can make deposits at Noble Poker via a number of safe and convenient methods. These include VISA, Master Card, VISA Electron, Delta, Solo, Maestro, NETeller, EntroPay, Moneybookers, Click2Pay, ClickandBuy, InstaDebit, myCitadel, Paysafe Card, WebMoney, Ukash, iDEAL, POLi, Przelwey24, Sofort and direct bank transfer. 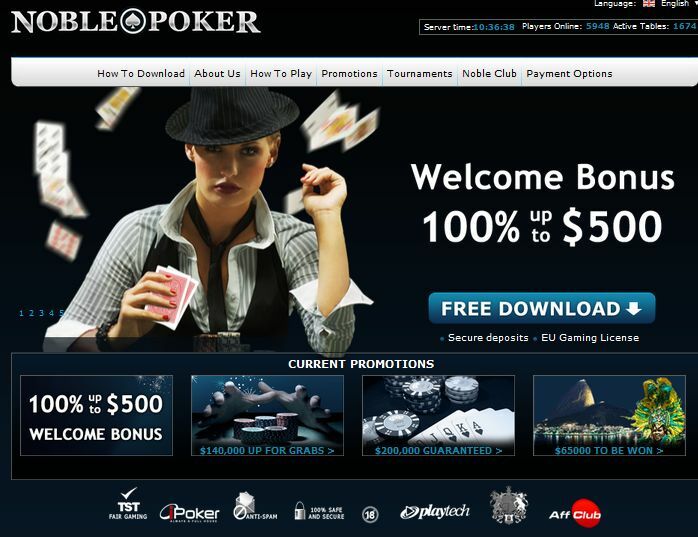 Noble Poker accepts deposits in US dollars. Topjack Games Mega Jackpot Extended to Blacjack! Where can I play free online poker by myself? Playing in a Real or an Online Casino?